We just left Gibraltar yesterday, which is British, so now we switch gears! We’re enjoying many cultures along the way on this cruise! The highlight of our day in Alicante was a grand tour of Castillo de Santa Barbara, which is a Moorish fortress perched atop Mount Benacantil. The views of the city and the harbor from the castle were breathtakingly amazing! This intriguing fortress is one of the first things visitors notice in the city, as it is huge, imposing and sits high above the city protecting the harbor. 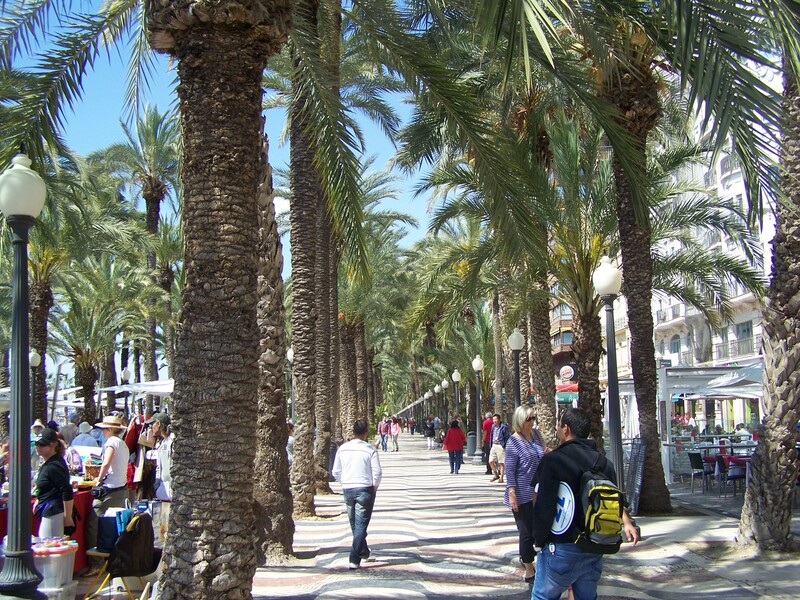 We took a stroll along the Explanada de España, a palm-lined promenade with shops and cafes. Alfresco dining is the norm here, it seems! Every restaurant we saw included many outdoor tables, some with umbrellas or awnings and some in the open. Today is Sunday and the tables were beginning to fill up as we came through. Our tour guide told us that people revere their Sundays for dinning out, and will scrimp on weekday meals in order to partake in this cultural tradition. I enjoyed the best pistachio ice cream ever at Kiosko Peret at Explanada De España! What a sweet memory. Back at the ship, we are getting ready to end the first cruise and begin the second of our three, two-week consecutive cruises. Barcelona is the end and it’s the beginning! See you in Barcelona tomorrow! Thanks for visiting Trilla’s Travels!